Trogir-Apartments.co.uk offers you the largest list of private accommodations in Seget Vranjica available on the internet, a rich photogallery and much more. Find apartments, villas with pool, studio-apartments, from cheap rooms to luxury apartment with no reservation cost. Check out guest reviews and ratings, and have a best vacation in Seget Vranjica. Apartment, max 4 persons town of Seget Vranjica If you are think up about ideal family vacation and trouble-free accommodation then you really should pick this apartment. Trendy apartment is positioned only 10m from the beach. Distance to the beach: 10m. Distance to the ferryboat: 5km. Distance to the golf club: 30km. Distance to the restaurant: 250m. Entertainment and Outdoor activities: TV, Satellite television. Peaceful accommodation, close to the sea, Seget Vranjica town of Seget Vranjica For a perfect holiday with family members or friends on the sea shore, choose this family apartment, situated in the tourist center of Seget Vranjica near Trogir. The spacious apartment is equipped with all the amenities required for an enjoyable holiday, such as a/c and private parking. General details: air conditioner, garden, barbecue, parking. Entertainment and Sport: TV, Satellite television. Apartment, max 4 persons town of Seget Vranjica Book accommodation outside the center of Seget Vranjica and enjoy the great family vacation in one of the most popular seaside resorts in Dalmatia. Aside from the roomy courtyard with a charming garden and a private car parking, this apartment provide you with comfy interiors, completely equipped with modern amenities. General details: air conditioner, hair dryer, garden, parking. Entertainment and Sport: boat, table tennis. Holiday apartment, 38 square meters town of Seget Vranjica If you wish to spend your holiday breaks in Seget Vranjica, then this accommodation is ideal for you. Entertainment and Sport: tennis court, TV. General details: air conditioner, hair dryer. Air-conditioned accommodation, 37 square meters, close to the beach town of Seget Vranjica Book accommodation outside the center of Seget Vranjica and enjoy the ideal family vacation in one of the most famous seaside resorts in Dalmatia. In addition to the spacious courtyard with an eye-catching garden and a private parking, this apartment provide you with comfortable interiors, fully equipped with modern conveniences. Distance to the beach: 230 m. Distance to the restaurant: 250 m.
Air-conditioned accommodation, with jacuzzi, 118 GBP per day town of Seget Vranjica price per day from £ 118 Private accommodation is situated in Seget Vranjica, a little tourist spot on the Trogir Riviera and is just 5 m from the beach and the beautiful Adriatic Sea. The villa offer their guests a roomy terrace with barbecue, so don't hesitate to try traditional Dalmatian meals. Distance to the beach: 5 m. Distance to the ferryboat: 33 km. Distance to the train: 33 km. Entertainment and Outdoor activities: boat, TV, Satellite television, radio. Accommodation, max 8 persons, Seget Vranjica town of Seget Vranjica The villa is nicely furnished and the most important features are large balconies and terraces that will make sure you enjoy in privacy of your accommodation. The house is also surrounded by lots of greenery so that you can really feel the Mediterranean ambiance in Seget Vranjica. Entertainment and Sport: boat, TV, Satellite television. General details: air conditioner, hair dryer, garden, terrace, balcony, barbecue, parking. Air-conditioned accommodation, 160 square meters town of Seget Vranjica Nicely decorated, comfy and fully equipped villa is located in Seget Vranjica. Enjoy a stroll around the city whose attractions will delight you. Entertainment and Outdoor activities: TV, Satellite television. Distance to the restaurant: 200m. Distance to the train: 28km. Distance to the golf club: 1km. Distance to the beach: 40m. Luxury accommodation, close to the center of town town of Seget Vranjica High quality accommodation in this villa gives you with a remarkable vacation in Seget Vranjica near Trogir, for that reason book it on time. Aside from elegant interiors equipped with modern amenities like air conditioning and wireless internet, on the roomy terrace of this accommodation you can have breakfast with a calming view of the village. Distance to the beach: 1km. Distance to the restaurant: 1km. Entertainment and Outdoor activities: TV, Satellite television. Luxury Mobile Homes town of Seget Vranjica Situated in Camping Vranjica Belvedere, just 5 km from the UNESCO-protected city of Trogir and its landmarks, High-class Mobile Homes is surrounded with pine trees and Mediterranean vegetation. Various sports amenities, an outdoor outdoor pool and eating places are present on site. All mobile homes are air-cooled and come with a private back yard with seating furniture and a gas barbecue. A well-equipped kitchen with a dining area and satellite television are present in each unit. Each unit is only 150 metres away from the sea. Not far away facilities include a children’s playground, a fitness area, an internet café and innumerable sports facilities for instance mini-golf course, as well as tennis, volleyball and basketball courts. Guest house Jozić town of Seget Vranjica Simple reachable on the state road in Seget Vranjica, Bed and breakfast Jozić has a dining establishment serving Mediterranean food and presents air-cooled rooms with minibar and satellite television. It is approximately 5 km from the UNESCO-protected city of Trogir. The rooms all have a toilet with shower. Visitors can shop for groceries 200 metres away, and there is a pebbly beach 800 metres from the guest house. A bus stop with connects to Trogir is 200 metres from the property. Split Flight terminal is 8 kilometers away, while the town is at a distance of 35 km. Holiday house Margarita town of Seget Vranjica Holiday house Margarita is set in Seget Vranjica and presents gratis wireless internet. The holiday home presents an outdoors terrace with sea and back yard views, a living room with a sofa and TV, a kitchen with a dining area and a toilet with a bathtub and a shower. At Holiday Home Margarita you will find grill amenities. Other facilities offered at the property include grocery deliveries. 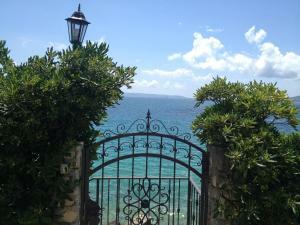 This holiday home is 10 km from Split Flight terminal. Hotel Medena town of Seget Vranjica Hotel Medena in Seget Donji next to Trogir and Split enjoys a beautiful location near the beach, boasting magnificent sea views. It presents a dining establishment serving various meat and fish meals as well as grilled specialities and tasty cakes. The restaurant of the Medena seats up to 1100 visitors and congresses, seminars, weddings and other festivities can be organised there. The air conditioned hotel is an exceptional beginning base to explore the not far away ancient towns. Paulina apartments town of Seget Vranjica price per day from € 40 Set in a tranquil area of Seget Vranjica, with rich Mediterranean greenery, Paulina Apartments presents a back yard with grill amenities. All rooms come with a furnished balcony looking out over the Adriatic Sea. The closest beach is 500 metres away. Easily embellished rooms have a private toilet with shower. Visitors can use a shared kitchen and there is a tiny refrigerator in each room. Free car parking is available on site. The UNESCO-protected historic centre of Trogir can be reached within 7 km. Coastal promenade is a 15-minute walk from the Paulina. 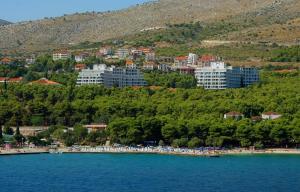 Seget Vranjica is a tourist village which is located only 5km from the well-known town of Trogir. It is perfect for a family holiday without the summertime crowds in the stunning Mediterranean environment. Seget Vranjica is defined by attractive sand and pebbly beaches, tiny bays, medieval olive plantations and vineyards, and countless islands that are perfect if you like to make a one-day tour. Sports addicts can enjoy football, beach ball, tennis, biking, scuba diving, sports fishing, trekking and many other adventures. Its remarkable cultural ancestry calls for sightseeing and evening hours strolls. high-quality accommodation offer (hotels and resorts, camping areas, apartments) is a warranty of great starting point for area sightseeing and adventures. The surroundings are characterized by rich Mediterranean vegetation, aged vineyards, and olive groves, appropriate for strolling and biking. Close by there is many islands and islets, perfect for trips by sailboat or yacht. Seget Vranjica is an ideal spot for those who want a peaceful vacation, far from the rush of big tourist towns. Seget can be proud of with a really diverse cuisine. Countless pizzerias and taverns offer an extensive array of various meals. Do not skip a meal in the enjoyable environment of tavern Frenkie. Taste fresh seafood delicacies, drink a bottle of high-quality wine and take pleasure in the local desserts. Excellent offer of healthy food (fruit, vegetables), especially from the hinterland, along with domestic products and seafood, sports and leisure possibilities, sea sports and night sports fishing, make Seget and its surroundings a desirable traveler retreat, that complies with most different demands of vacationers. Delicacies and specialties of the location can be enjoyed in the restaurant "Astoria, in addition to taverns "Kamenica" and "Villa Rustica Dalmatia". Tavern "Tragos" - situated in the middle of the historical part of Trogir offers traditional fish and meat meals. f you wish to get familiarized with the past of the neighboring area, check out the cultural center of the area, the city-monument under the UNESCO protection, Trogir. See the attractions of its old town, Kamerlengo citadel, the tower of St. Marco, Chapel of St. Jeronim, Cipiko palace, Radovan's portal, art galleries, museums and many other historical monuments. In addition to wine cellars and restaurants in the town itself, we also highly recommend paying a visit to restaurants in towns of Seget and Trogir, while leisure and nightlife can be found in many close-by tourist centers of fun such as Split, Primošten, Trogir, and Rogoznica. Split and Trogir summer festivals are 2 well know cultural events you should also check out. On the river Cetina, which is one of the most attractive rivers, you can enjoy the beauties and adrenalin of rafting tour. It lies in a tame end of the Dalmatian Zagora, smoothly flows via countless valleys with villages and mountains surfacing against it. For nature enthusiasts, the right choice is the nearby National Park Krka.